Was CS Lewis Right About Only Two Religious Options? The beloved story-teller and insightful defender of Christian faith, C.S. Lewis, is often noted as having said that there are really only two basic religions to choose between: Christianity, with the idea of distinct supernatural and natural realms both controlled by God, and Eastern pantheism (which takes various religious forms) in which everything is God. What such a viewpoint (from either of these worldviews and their related religions) does is reinforce a tendency we already have… one that is gets us in trouble when we apply it too strictly to this matter, as most people do. That is to see things in either-or categories or polarities — basically opposites. Are there really only two viewpoints to see (and interpret God and life) from? Readers of this blog know that I frequently refer to or promote a 3rd option… a sort of “in between” position sometimes called panentheism. The word basically means God is in all things but not equated with all things, being also “beyond” them. I suppose it is simpler to think that God either really is the creation or stands apart from what he/she created. Now, science gives preference to the simpler explanation of things, all other factors being equal. I’m not so sure theology does that very much, though I think it is an aim (and I “do” a fair amount of theology). On the surface, either of the two main worldviews are simple. But the bulk of Christianity still envisions things in terms of God working from the outside-in (to us) more than the inside-out (or from everywhere to everywhere). Many, many of the faithful, via misreadings of Genesis, specifically affirm goofy ideas of how God created from outside. It’s critical to them to stand against the idea that God might actually be in and behind the evolutionary process – that God might be in everything. And their God coerces from “out there” via punishments or threats of them (damnation particularly), while “he” is also seen as loving. This also holds for many who do not so adamantly oppose the idea of evolution. My only point, for now, is to point out that more than two ways exist of envisioning God-in-the-world. We are not forced to choose between a simplistic one or two-tiered universe in which God either coercively controls everything from beyond it or effectively doesn’t exist (being identified completely with the universe). There are ways of understanding “relationship with God” without reducing God to mere humanity or difficult-to-reach divinity. What do you know of third options? The main one I know of which has been developed systematically and extensively as a coherent picture for almost a century is called “process philosophy” and/or “process theology”. I have found it very helpful and even inspiring for a number of reasons — both in my personal spirituality and in my hopes for the future of interfaith and science-religion relationships. Neither of Lewis’ (or most people’s) two major options provides much hope in these areas, that I can see. Happily, I observe that in various ways religious leaders, lay people and “spiritual but not religious” folks are moving toward more nuanced views akin to or specifically within a “process” perspective. It is not my purpose here to discuss this further, but will note that on the sidebar to the right are some resources that can get you started in exploring this perspective and the many things it speaks to and has to offer. C S Lewis is arguably the most highly over-rated Christian propagandist or talking head. He is of course very popular with right-wing Christians or those associated with the essentially totalitarian (in intent) Manhattan Declaration, and First Things too. To see how baneful they are check out their website Touchstone Magazine and the even worse site associated with them, Salvo Magazine. Frederick, thanks for contributing here. For a number of reasons, Lewis has indeed been one of the widest read of Christian “apologists”. Actually, in his personal life and his views as well (as member of Ch. 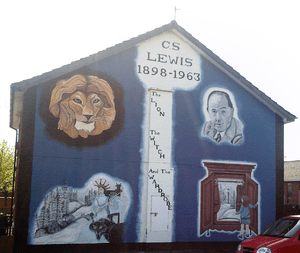 of England, not some American Evangelical/fundamentalist church), Lewis was MUCH less conservative, intolerant, etc. than many who love to lean on his work. Its emphasis was on support of the BROAD spectrum of “historic Christian faith” (not necessarily his phrasing). It was not on denominational or otherwise marginal aspects. What I find regarding many “neo” Christians, as seems represented here, is that they find Lewis frustrating because he very much interprets the Christian message as an “either/or” proposition. In fact, this is as it should be. In very little, doctrine-wise, did Christ offer anything like a “third” position on things. Much of what he preaches is either/or. Either you follow my commandments as proof you love me or you do not; there is NO third option. What Lewis does wonderfully is to transcribe the writings of the Scriptures into the realities of actual life. To discuss the Gospel in terms of “Scholarship” or “Process Theology” seems a false notion. Christ did not call “scholars” and those processing theology (think Pharisees and Sadducees) for the very reason that such “professing” tends to insert human thinking and reasoning into the Theology of God rather than developing a thinking and reasoning based on belief in the Gospel of Christ in the first place. God is indeed on the outside working towards us and our challenge is to work on the inside of what and who we are towards God. There is no “third” option. Thanks for commenting, Tony. I don’t know if you’ve read my story or know much about my own Christian background. Suffice it to say I was raised in a “Bible believing” and sincere Christian home and church community, followed by conservative Christian college and then seminary… all pretty happily till about age 45 (now 23 years ago). One vital thing I gradually realized was that as much as sincere, faith-filled Christians focused on the “simplicity of the Gospel”, it was apparently impossible to come to an agreed-upon understanding of just WHAT was to be believed and followed of both Jesus’ recorded sayings/teachings and the rest of inspired Scripture. In other words just what IS the “good news” (Gospel) that must be believed and the understanding of Christ which must be accepted? Despite the difficulties of interpretation which cannot be fully gotten around, I do believe it of real value to seek to “follow Jesus”. But it certainly is not just an either you do or you don’t proposition. I might suggest this exercise to see what I’m getting at: Read each of the four canonical gospels (there are others from the same general time period, at least one or two of them perhaps older than one or more of the four) separately. Maybe give a week or so between the reading of each. But during or right after each reading, write down YOUR summary of the key picture of Jesus, his role, his claims (to messiahship? to being God? ), etc. If you’re observant, I don’t think you can miss the fact that while the first 3 overlap and are generally presenting a similar viewpoint or understanding, John differs greatly from the others. It certainly seems, if one reads without conflating all accounts together as most Christians tend to do, that John presents a Jesus who is not at all the same person as that of the other three. Extensive “scholarship” has provided a lot toward understanding why and how this is so, and at least partially grasping why the simplicity you suggest may be OUR creation more than that of the Bible.